Once, during one of my high school cross country meets years ago, a teammate and I were running together when we came upon a runner from another school who had collapsed in pain. As we passed our rival, my teammate looked down at him and unleashed a string of expletives meant to wish him anything but well. The point is, I wanted to tell that story and reviewing a film about high school cross country seemed the best time to do it. McFarland, USA, is the latest from Disney’s division of inspiring sports stories, and it’s a perfectly pleasant if unremarkable take on… an inspirational sports story. In the late 1980s, a high school teacher and coach named Jim White started a cross country team in the small, mostly Hispanic town of McFarland, California. Despite very humble beginnings, the team won the state championship in its very first year and didn’t look back, ultimately becoming a powerhouse program. It really is a nice underdog tale, and I’m surprised it took this long to get a film adaptation. It comes complete with the “white savior” angle, and an understandable logic in telling it from his point of view. Coach White’s (even his name is tailor made for suburbia!) status as the main character doesn’t hit you like a blind side (pun very much intended) of manipulation, and there are ample opportunities to make salient points about the changing fabric of America. Though the script isn’t as serious about these issues as it could have been, at least the effort is there, buoyed by some graceful direction from Niki Caro (Whale Rider, North Country). We learn, as the coach does, about a segment of the country that’s often out of sight and out of mind. But as the team comes together and lessons are learned, the film is content to keep the cultural issues broadly drawn, toeing an awkward line between awareness and pandering. As Coach White, Kevin Costner gives the film exactly the type of rock solid anchor you would expect. Through the periods when the narrative seems less than believable and his supporting cast wavers, Costner’s earnest authenticity provides constant forward momentum. And though Maria Bello’s role is reduced to the obligatory supportive helpmate, she and Costner do manage a sweet chemistry. 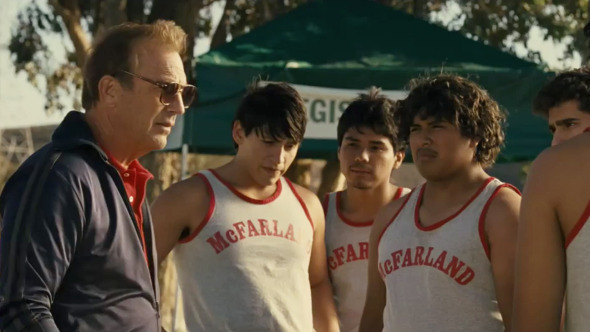 A touching introduction to the real people of McFarland, USA ensures the film hits the finish line on a high note, even if the result isn’t quite one for the record books.